The city of Mooresville, North Carolina is located in Iredell County has a subtropical climate zone with a wedding season from March through November. During those months the weather around the Mooresville, NC area has highs between 60 degrees and 90 degrees. Mooresville has a large number of beautiful green outdoor areas that are ideal to host a wedding. Our restrooms fit in anywhere from fairy tale, fancy, southern style to barn weddings. With the help of Fancy Flush you can now pick the perfect indoor or outdoor wedding venue regardless of if they have restrooms or not. Amaze your guests with our VIP or LUX series portable restroom trailers which offer far more luxury than what you'd typically find at most venues. Our fancy portable restroom trailers are a great idea to supplement your existing restrooms or to provide portable restrooms where none previously existed. Many venues such as your house only have enough bathrooms for a few guests to use before large lines form. 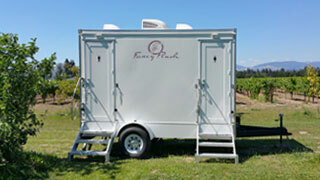 With Fancy Flush's restroom trailers you can now add premium luxury bathrooms so that all your guests can use the bathroom when they gotta go. 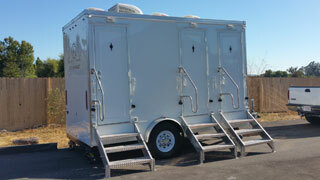 Unlike most portable toilet rental companies Fancy Flush only rents luxury restroom trailers, not plastic porta loos. 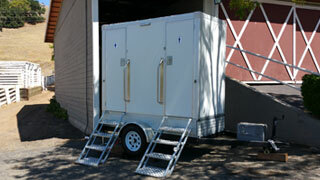 We recognise that our clients needs are different than those who require a porta potty. Instead of having hundreds or thousands of clients per week we have up to a dozen clients so each one of our clients gets our full attention. We realize how much time and effort you put into pulling off your event, so the last thing you want is an issue with the bathrooms. Instead of concentrating on porta potty routes we spend our time maintaining our restroom trailers so that everything is working properly. Lastly, we understand that when renting a restroom trailer you wish to provide your guests with a restroom rental that's elaborate and luxurious. We design each of our trailers with this in mind, so all of our restrooms have fancy decor that is sure to impress and we even add little touches such as flowers and art work. Find other local wedding and event vendors that we've worked with and recommend.